Two years ago launched game “Oddworld: New’n’Tasty” has been released on Android in google play store. You can buy it blindly because this one is a fabulous pack and a great deal. Story – The main role of this story is Abe and his boss Modluck the Glukkon. His boss runs a meat-packing empire. Due to low sales and profit, his boss plans to turn Abe and his fellow Muddokns into Tasty Treats as a final effort to rescue Molluck’s failing meat-packing empire! Abe heard this plans from his boss and wants to save his fellows. Can Abe rescue the Mudokons? Can he escape the dark recesses of RaptureFarms? It is a sidescrolling platformer game with puzzle solving elements in which you play as Abe. You can talk to and direct other Mudokons like “follow me” and other Mudokons will start following. 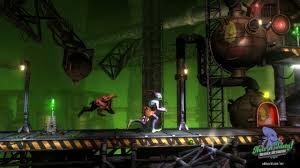 What’s your goal in Oddworld: New’n’Tasty Game? Your goal is to save all 299 Mudokon slaves at RuptureFarms which can be done by taking them to bird portals; several Mudokons are hidden in secret areas which often involve complex situations. There are some areas in the game which require the player the memorize Abe’s whistles, farts and Slig’s BS and SM’BS commands to unlock electric fences, allow Mudokons to pull levers and platforms. The story of Oddworld: New’n’Tasty is amazing. You need at least 2GB RAM To play this game. You can change performance in settings of the game. Get it from here[Paid, Google Play Store Download Link].